Clean water and intact landscapes — the two main features of the beaches of Croatia. From Istria to Dubrovnik, with more than 1000 islands Croatia has over 6000 kilometers of coastline with an amazing variety of beaches. Family, for water sports, nudist, sandy and pebble beaches, to suit all tastes and for all kinds of travelers … Many of them are available, others are more isolated, which can be reached only by boat — but all provide a sense of pleasure in paradise. And so, let’s find out what are they the best beaches in Croatia. 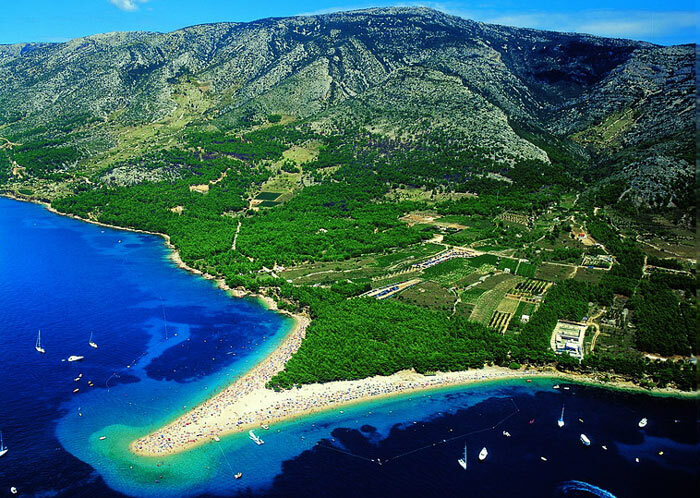 It is located in the quiet town of Bol, on the southern island of Brac. This is probably the most famous beach in Croatia image of a golden horn, the end of the form which varies depending on the wind and tide. This beach deepens half a kilometer into the sea and is a haven for surfers, since there is always the wind is present. Also there is a school of surfing and diving. Also worth noting is that this is one of the best beaches in Europe.